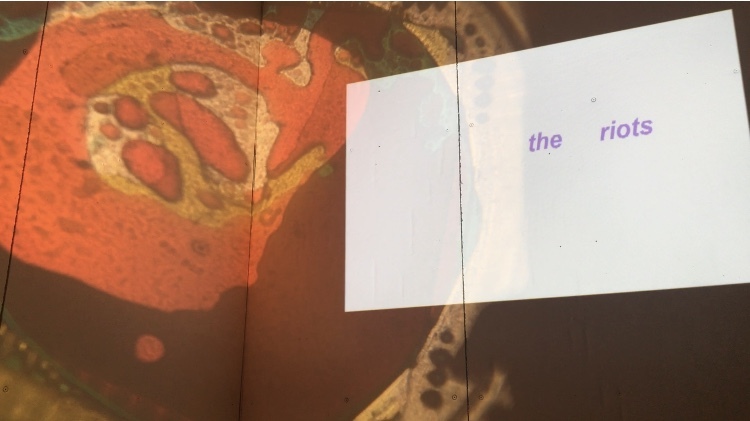 For my conference project, I combined a digital projection of various poems I had written with a liquid light show; dishes filled with mineral oil, water, and food dye projected on an ELMO overhead projector. A lot of my poetry aims to simply create another world in which the reader can enter. 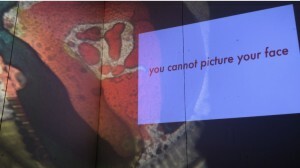 For my conference project, I aimed to take this experience farther by using the projection to visually create a space. 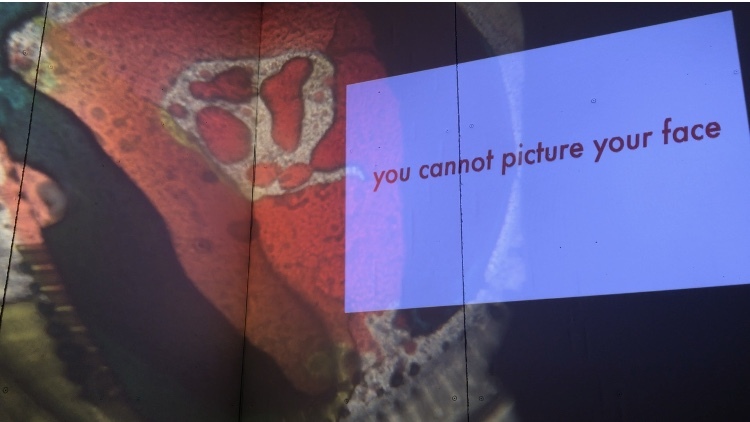 I felt as though I certainly created a space through the projection, but perhaps not my words, as most people didn’t really take much time reading the poetry. 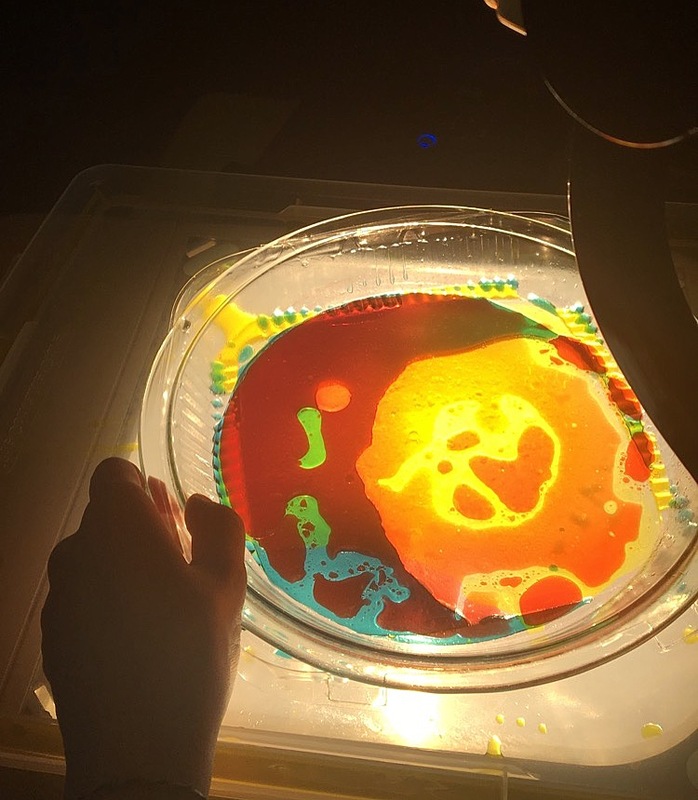 At first, I originally only used two dishes for the oil, water, and dye. However, I decide to try using a third vessel, a large flat-ish plastic box top. I felt as though this made a huge improvement on the quality of the liquid light show, as it allowed me to use more colors without them mixing. 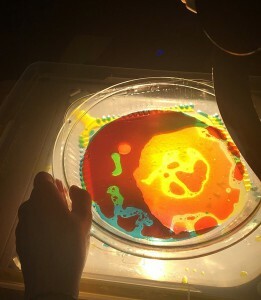 If I were to do this again in the future, I would try something other than food coloring, as it didn’t quite have the vibrancy I wanted. I would also invest in clear glass clock faces or something similar as opposed to what I used. It was shockingly difficult to find a clear plastic or glass dish that didn’t have a logo or something on the bottom. Finding materials was probably my biggest frustration. Overall, I was pleased with how this project turned out, as I felt it for the most part accomplished what I wanted it to. 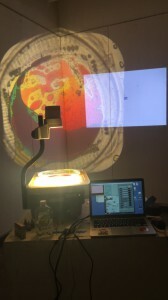 I will definitely be using both projection techniques for other projects in the future.